Why is it so important to know proper foot care for diabetes? Over time, diabetes can cause irreversible damage to your feet and health. Diabetes can cause you to loose feeling in your feet and lower the amount of blood flow in your feet. Thus, resulting in numbness in your feet and leading to serious foot problems like amputation. If you know you are living with diabetes, be fully aware how to prevent foot problems from occurring, recognizing early problems, and seeking medical help when problems occur. Get in the habit of inspecting your feet every day. It is crucial for your well-being and health. If you ever notice a change in your feet or experience any conditions mentioned below, seek care early. 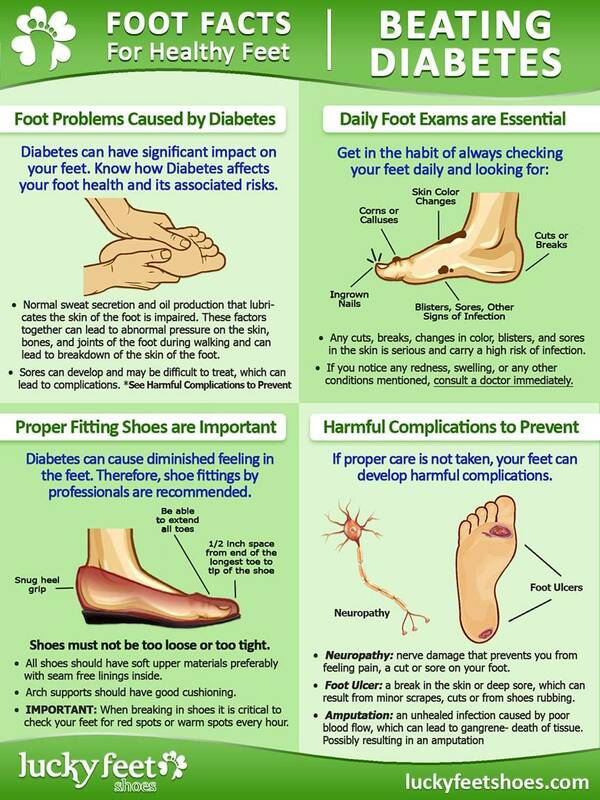 Diabetes can have significant impact on your feet. Know how Diabetes affects your foot health and its associated risks. Normal sweat secretion and oil production that lubri- cates the skin of the foot is impaired. These factors together can lead to abnormal pressure on the skin, bones, and joints of the foot during walking and can lead to breakdown of the skin of the foot. Any cuts, breaks, changes in color, blisters, and sores in the skin is serious and carry a high risk of infection. If you notice any redness, swelling, or any other conditions mentioned, consult a doctor immediately. Diabetes can cause diminished feeling in the feet. Therefore, shoe fittings by professionals are recommended. Shoes must not be too loose or too tight. All shoes should have soft upper materials preferably with seam free linings inside. Arch supports should have good cushioning. IMPORTANT: When breaking in shoes it is critical to check your feet for red spots or warm spots every hour. If proper foot care for diabetes is not taken, your feet can develop harmful complications..
Neuropathy: nerve damage that prevents you from feeling pain, a cut or sore on your foot. Foot ulcer: a break in the skin or deep sore, which can result from minor scrapes, cuts or from shoes rubbing. Request a personal fitting and let us help you find shoes that may help you prevent foot complications.